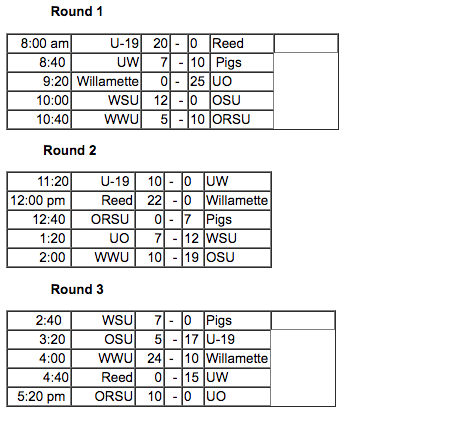 The ORSU women host an annual round robin-style tournament, “BabbFest”, that brings together women’s and collegiate rugby teams from all over the Pacific Northwest. Originating from the traditions of ORSU’s previous tournament Jesterfest, and formerly called the Jester Round Robin, and in 2010 the tournament was renamed the Lindsay Babb Jester Round Robin, or “BabbFest”. Named in remembrance of extraordinary Jester Lindsay Babb, BabbFest is a celebration of the spirit of rugby – the heart that it takes to hit the pitch for some tough play and come out grinning at the end of it all. Like Babb always did, the tournament promotes a day of good hard-running women’s rugby, followed by a friendly social where teams can mingle and celebrate their efforts. We also take this opportunity to honor Domestic Violence Awareness Month, and to highlight the resources offered by our community partner Raphael House of Portland. For more DV resources, visit Raphael House’s website; their crisis line is 503-222-6222. Watch this space for the 2019 Babb Fest dates! Thank you, everyone, for a fantastic BabbFest 2012! We can't wait to see you all next year. Rugby love! BabbFest was again graced with perfect sunny weather for the 2011 tournament. Ten teams, including women's, collegiate, and U-19 gave their all in a fantastically fun day. Coaches and referees also voted on awards. WSU won Best Team on the Pitch, with individual Player of the Tournament honors going to back Megan Bonny (WSU) and forward Kiana Saluni (OSU). Back Hannah Lockwood (OSU) took the Best Boot kicking award. But the fun wasn't over - everyone "suited up" for a rambunctious social, with quality local brews from Bridgeport Brewing. The Pigs narrowly edged the U of O for the Most Spirit team costume award. ORSU's own Jenny Menke won the individual Most Spirit award, flaunting not one, not two, but THREE phenomenal costume changes. Thank you again to our volunteer refs! Great work by all, and we look forward to seeing you next year! BabbFest 2010 was a great success, with perfect weather and some good clean rucking fun! Ten teams from around the Pacific Northwest mixed it up, with players coming from as far as Humboldt, Bellingham, and Boise, and a superstar referee/fan contingent flying in from the Bay Area. We were also honored with the presence of the Babb family: Lindsay's grandparents, aunts, and uncles. The tournament prize was a $300 merchandise voucher from Tsunami Sportswear, for the team who best embodied the spirit of rugby. It was awarded to UW, who had some tough match-ups but worked hard all day and never gave up. The tournament theme was "Year of the Unicorn", featuring colorful unicorn tournament shirts. Players and fans got fancy at the social in unicorn costumes and flashy tracksuits, with those who were of age enjoying some quality local brews from Bridgeport Brewing. ORSU News in your Inbox! Don’t miss a game, or an event. Sign up for our newsletter updates. We won’t spam you, we promise. Thank you! We look to see you out at the Oregon Rugby Center soon! Check out our Schedules page for an updated list of games.